One of the reasons I love to sell Evergreen, Colorado real estate is that my clients are buying more than a wonderful home in a world-class location. They are buying an exciting variety of lifestyles in our mountain town posing as a Denver suburb. Evergreen enjoys music, theatre, art, and abundant recreation options and outdoor activities. Last weekend Friday, July 29 - Sunday July 31, we were blessed with the Evergreen Jazz Festival. 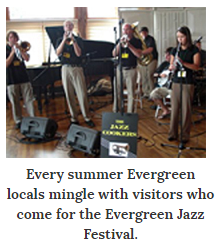 Evergreen Colorado real estateThe Evergreen Jazz Festival is celebrating their 10th Anniversary with a successful format of Traditional jazz, Blues, Swing, Dixieland, and Boogie. The festival was founded by Sterling Nelson who searched the nation for jazz groups and musicians to bring excellent entertainment to Evergreen. Over 100 dedicated volunteers put together what one jazz writer called "the best jazz festival anywhere." All of Evergreen joins in the fun with several venues offering music, dancing showcases, and workshops from 11:45 am until 10:30 pm. You can enjoy the acoustic setting of the Evergreen Christian Church, club-it at the Little Bear, relax overlooking Evergreen Lake at the Evergreen Lake House, or dance all day and night long at the Heritage Hall of the Elks Lodge. Folks from Denver and out of town often spend the weekend at one of our famous bed-and-breakfasts or the Black Forest Inn. While one day tickets are available, spending the night here is the most fun. Lucky Evergreen residents get to breathe our fresh, pine-filled air all year long and not just during the Jazz Festival. This year's acts include The Yerba Buena Stompers, Rain Dogs from Kansas City, Independence Hall Jazz Band from Philadelphia, Jazz Cookers, Hot Tomato Dance Orchestra, Joni Janak & Centerpiece Jazz, Don Stiernberg Quartet, stride pianist John Royen from New Orleans, After Midnight, Gypsy Swing Revue, and numerous other local and national acts. Plenty of food, cocktails and non-alcoholic drinks are available and regular, free shuttle service is available between all the sites. Tickets range from $15 half day tickets for individuals to $145 for full access all three days. Don't miss this perfect example of why Evergreen, Colorado is a very special destination. Next year, be sure not miss this exciting event. And, if you want to know more about Evergreen as a place to live, contact me on the form below. I can tell everything you want to know about our homes and lifestyles!